Even in that case using the right TTY is a good idea. Rimrul wrote: ↑ You did verify COM5 is the correct port? IIRC it changes when switching to bootloader and I just tried them until I hit the right one, resetting again every few tested COM ports. That worked, thank you so much! It still failed because the hex must be in the wrong place, but whatever. Where do i put it/how do i specify where to grab from? I recently used a Pro Micro as a controller (not converter) for my Model F "Bigfoot" keyboard running Soarer's firmware. would be one pin short (PB0) see http://i.imgur.com/wMNx2u6.png. However, by removing the R4 resistor (current limiter for the yellow TX LED, which wouldn't be seen anyway since the Pro Micro is mounted inside the Bigfoot case) and soldering to the pad vacated by R4, I was able to gain access to PB0 and thus successfully make the Pro Micro work as my controller. jim121049 wrote: ↑ I recently used a Pro Micro as a controller (not converter) for my Model F "Bigfoot" keyboard running Soarer's firmware. Awesome! This is just in time, as I will be getting some springs for my cannibalised Bigfoot soon, and I have just Pro Micros laying around Can you mark the R4 on the pic you linked? 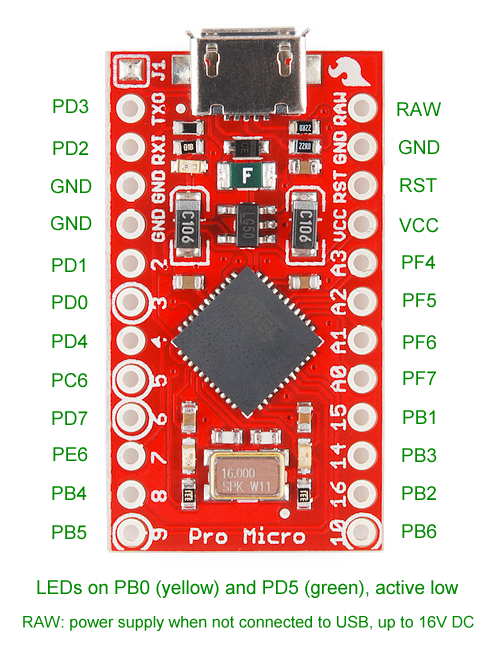 The R4 resistor is in the lower left corner of the Pro Micro. It is immediately below the yellow LED, between the hole labeled "8" and the 16MHz crystal. The lower of the two pads vacated when R4 is removed connects to pin 8 of the ATmega32U4 which is PB0. 1. Connect "Frame Ground" on the Bigfoot's circuit board to "GND" on the Pro Micro. My setup wouldn't work correctly without this connection. 2. I changed "debounce 1" to "debounce 5" in the "bigfoot.sc" configuration file to solve key bounce problems with some keys. The documentation found in Soarer_Controller_v1.20_beta4.zip states that 5 is the default value. Last edited by jim121049 on 28 Dec 2016, 12:56, edited 1 time in total. Thanks! I'll try it out next week probably. I had been stumped for the last week about why my Pro Micro (5v version) clone wasn't working with a Model F XT, but worked fine with a Model F AT. Turns out the Pro Micro I was using didn't have J1 soldered and thus there was additional voltage drop to the keyboard. On the particular PC I was using, the keyboard was only getting 4.0v. Once I bridged the jumper, everything worked like a charm. So, if you buy a Pro Micro clone from eBay, make sure the J1 jumper is bridged, otherwise you might run into some combinations of PCs/keyboards that don't work. Last edited by megahertzcoil on 21 Feb 2017, 03:13, edited 1 time in total. megahertzcoil wrote: ↑ I had been stumped for the last week about why my Pro Micro clone wasn't working with a Model F XT, but worked fine with a Model F AT. Turns out the Pro Micro I was using didn't have J1 soldered and thus there was additional voltage drop to the keyboard. On the particular PC I was using, the keyboard was only getting 4.0v. Once I bridged the jumper, everything worked like a charm. megahertzcoil wrote: ↑ I had been stumped for the last week about why my Pro Micro (5v version) clone wasn't working with a Model F XT, but worked fine with a Model F AT. Turns out the Pro Micro I was using didn't have J1 soldered and thus there was additional voltage drop to the keyboard. On the particular PC I was using, the keyboard was only getting 4.0v. Once I bridged the jumper, everything worked like a charm. Interesting. I had exactly the same problem with a Pro Micro clone and my Model F XT keyboard. I posted a message in this very same thread about the J1 jumper back on May 11, 2016. Thanks for figuring that out jim. Using it in my Bigfoot like that. Unfortunately I managed to pull the pad on the first Pro Micro I tried it with. I should probably add a liberal amount of hot glue on this working one some day. //e now that I read it, I don't think my J1 is bridged. Thank you so much for this Tutorial! I've managed to use a Pro Micro as a controller for my handwired m0116! I've done it under Windows 7 x64. So, I'd like to tell about one issue I've faced with. Windows didn't recognize the device, of course, then I installed drivers manually, as SparkFun recommends. After that I got the Pro Micro in my device list under 'Ports Com & Lpt' section, associated with com5. So far -- so good. But when I pushed the ProMicro into the bootloader mode it didn't change the com-port number (like it says in all tutorials I've read). All of a sudden, it turned again to the 'Arduino Leonardo' with a question mark under 'unknown devices' section in the device manager. And, after 8 secs, it turned back to 'SparkFun ProMicro on com5' under 'ports com & lpt' section. I've tried a dozen of times until succeeded Then I found out that in bootloader mode the port number changes to com6. And then I easily flashed the Soarer's code using the fresh avrdude for Windows. Voila! It turned out the XT layout is not that weird. When I started to touch-type I suddenly got that every key is exactly on its place. I want to make sure that the Model M will work (didnt got to solder the pro micro in). Managed to do this on my 5155 portable. Burned my teensy w/c was its previous controller (don't ask) thus tried using a cheaper approach. Bought a pro micro from Banggood and worked perfectly. Thanks scottc for the tutorial. kokokoy wrote: ↑ Managed to do this on my 5155 portable. Burned my teensy w/c was its previous controller (don't ask) thus tried using a cheaper approach. Bought a pro micro from Banggood and worked perfectly. Thanks scottc for the tutorial. Oh, excellent! I look forward to pull the same stunt on the 5155 I got, too. One thing with mine though, I can't seem to use it on USB 3 but 2 works perfectly fine. kokokoy wrote: ↑ One thing with mine though, I can't seem to use it on USB 3 but 2 works perfectly fine. Really? I have no issue. It's either hooked up to a 3.0 hub or (if I take it and my laptop to work with her at the kitchen table) directly to a 3.0 port. Perhaps an incompatibility due to the Pro Micro being OSH and made by multiple manufacturers (and perhaps both are to official spec, but specs don't require 3.0)? Dunno really. I have used two different ProMicros by different manufacturers and both work fine. Have a half dozen en route but will test out those. As you can see, the SS Micro has a double-sided layout. Well, who needs to see the microcontroller ... the LEDs are more important. Both are cheap and can be used for Soarers Converter. One little problem is the thickness of their PCBs; both are a bit too thick to fit comfortably in a USB A socket (they do, but just about). Soldering a cable to the USB pins would probably be a good idea. Last edited by Arakula on 26 Nov 2017, 06:43, edited 1 time in total. Oooh, cool. They look great, thanks for sharing, especially with the annotated pinouts! They'd be great for a very small in-line converter. I might grab one to try out. The only CJMCU beetles I could find on AliExpress didn't have an atmega32u4, but an attiny85. It had a different pinout too. Anyone looking at these, be sure to get the right version. Searching for "beetle atmega32u4" or "beetle leonardo" turns up quite some on AliExpress and eBay. Arakula wrote: ↑ Searching for "beetle atmega32u4" or "beetle leonardo" turns up quite some on AliExpress and eBay. Ah yeah, thanks! That works. I have a Zenith Data Systems keyboard that needs the reset pin and I got a Pro Micro before I knew it lacked a PB7 pin out. I tried using the promicro without the reset pin but nothing works. Just got some lights and the keyboards all locked up, no good. Well before I saw Arakula's post on the alternate build for Pro Micros I was playing about and noticed the keyboard worked fine if the reset line from the keyboard was just tapped on the Pro Micro's ground pin. I then stuck a 220uf cap (I'm not really sure why I did this) between the keyboards reset and the Micros ground. With that in place everything's working great now. Why did that work? I've not a clue, not one. I made an ADB to USB converter using an pro micro (5V version) for my ISO UK AEK II and it works really well. Thanks to everyone for their contributions to this thread, made the process simple and answered all my questions I had throughout the process of making it. Resetting it was fine, so I did just that and then put on a rev.1 hex file. This time it recognised it immediately as an ADB converter and appeared as HID keyboard and mouse, which was great. Any idea why the rev.2 would not work but the rev.1 would? Is it a quirk of the pro micro? Also, the numpad equals (keymapd equal) is weird under windows, it outputs 5 in most instances and nothing in the command prompt. Anyone know why this might be? I changed it to regular equals, so it's not really an issue. Thanks laser, I can see now that it clearly states that out on Hasu's thread!